Welcome to this week's edition of the Frugal Roundup where I share just a bit of the fabulousness that is ALWAYS Frugal Friday here at the Shabby Nest. Last week's Frugal Friday was the biggest to date. It was a nice diversion for me to spend some time going through all those posts...here are a few of my favorites. Adventures of One Crazy Lady shared her pretty button-monogrammed pillow. This is a project I've actually had in the back of my mind for a while...after seeing Kari's cute version, now I *know* I'll have to get mine done! Country French Cottage shared her French inspired bathroom redo. Take a gander at the before pictures and you' ll be ASTOUNDED at the tranformation! 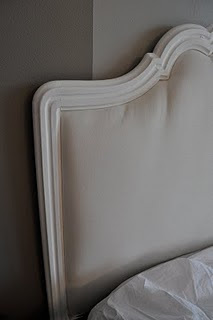 Emily Ann shared a super-fantastic upholstered headboard redo. So pretty! And finally, And Then There was Home shared her sweet nautical mobile. 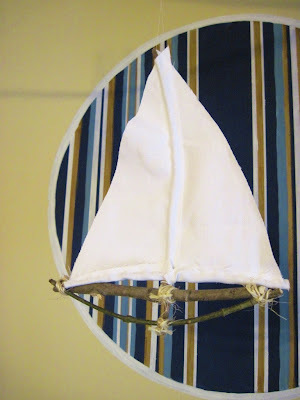 I LOVE the rustic simplicity of the mobile. Sooo charming! John is doing as well as can be expected at this point. They removed his chest tube today which helped to alleviate some of the pain in his chest...of course he still has 4 broken ribs to contend with, but at least the pain was a little less. The surgeon who worked on his leg came and told us that the xrays taken in the recovery room looked really good, so he is hopeful that the leg will heal well. John was more alert and talkative, although he tired quickly and was still in quite a bit of pain. The overall feeling of today was hopeful, however, and that did me a world of good. 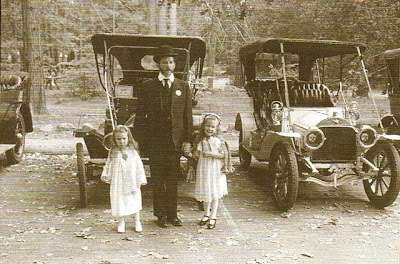 my dad restores antique cars and we dressed vintage to match the car. My dad's surgery today went well. He also injured a disc in his back as a result of his fall, so that is going to add to his recovery time, but all in all, he is doing well also. I just wanted to thank you all again for your kind words and your prayers. They truly are helping to carry us through this difficult time. You all are the best readers in blogland!! So glad to hear that John and your dad are both doing well. We'll continue to keep them both in our prayers. And you too! A relief to know that both the men in your life are on the road to recovery. This must be such a difficult time for you. My thoughts are with you. Thank goodness for the (relatively) good health news! You and your family are in my prayers! I am so glad to hear that both men in your life are doing so well. Yes, each of them will need recovery time, but even though it may seem slow, the progress will happen. Sending positive energy to your family members. Oh, forgot to say I loved the 'vintage' photo of the family with the antique cars. If it wasn't for the painted stripe in the photo you could have passed that off as a 'instant ancestors' photo. Maybe you could photo-shop that stripe out. I am glad to hear your husband is doing better. Great picture of you and your dad. I hope he has a speedy recovery also. Thank you, Lord for answered prayers!! Continuing to prayer for a quick and full recovery for her husband and father. Praying for your entire family during this tough time. So thankful that your husband and father are both recovering! We will continue to keep all of you in prayer in the coming months!! I love the photo of you, your sister, and father! I'm so glad that you've gotten good news and I pray that the healing and good new continues for you and your family. I'm glad to hear that both of the men in your life are healing! Sending prayers your way! Sending you lots of strength and hope as they both heal up! Take care! So glad to hear that they are both improving. You and your family will continue to be in our prayers! Take good care! I'm so glad to hear that your husband & father are continuing to heal. My thoughts are with you & your family. Oh Wendy...i am just now catching up and reading about John. my prayers are with you guys. Good news about your husband & dads recovery processes. And thank you for sharing new blogs to visit~always fun to discover new blogs! I'm just catching up and saw your terrible news! But I'm glad to hear they are both doing as well as can be expected. I've been too busy with back to school ect to read my fav craft blogs, so I just found out. So sorry about your husband and father. I'm glad things are going as smooth as possible. I just said a prayer for you all. I know that with prayer and time you can recieve blessings through your challenges.